Atrophy of caudate nucleus results in characteristic enlargement of the frontal horns, which take on a heart-shape configuration. Clinical triad: Early onset dementia, choreoathetosis, and psychosis. 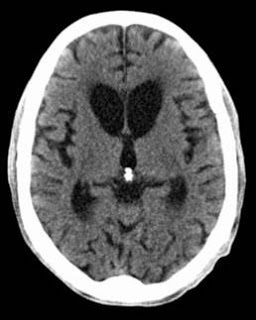 Atrophy of caudate nucleus (Cn), loss of convex surface of caudate head, enlargement of frontal horns of lateral ventricles. • SPECT: Perfusion defects in motor cortex, prefrontal cortex, and BG correlate with clinical disease. Polyglutamine expansion =} Huntington accumulates in nucleus and cytoplasm =} cytoplasmic Huntington aggregates in axonal terminals, neuronal loss and gliosis.